The story of Leeds crane making goes back to a firm established in Calverley in 1820 by Jeremiah Balmforth and David Smith. Just as the locomotive industry in Leeds had begun with firms established to make mill machinery, so did its crane making industry. They were primarily millwrights producing machinery for the woollen industry. In 1833 the firm were joined by Jeremiah Booth. They looked for further markets for their work and this included hand operated cranes from 1840. In 1847 Booth left and established his own crane making company at the new Union Foundry. In 1855 Booth's firm passed on to his son Joseph Booth and the name Joseph Booth & Bros was adopted. In 1858 Jeremiah Balmforth died and his son William inherited the position, to be followed the following year David Smith's son Thomas. The production of steam powered cranes is thought to have begun around 1860, however the two partners in the company fell out in 1861. Thomas Smith bought out the company and took control. Thomas Smith later brought his sons in to the business and they eventually took it over on his death in 1902. In 1918 the company was incorporated as Thomas Smith & Sons. William Balmforth established a new firm to manufacture quarry cranes, the Peel Ings Foundry, though this works did not enjoy the same success of those of Thomas Smith and Joseph Booth. Smith's Old Foundry and Booth's Union Foundry were both situated on a narrow strip of land between Town Street, Rodley and the Leeds & Liverpool Canal. Large demand for their cranes in docks, quarries and construction sites saw both businesses thrive. 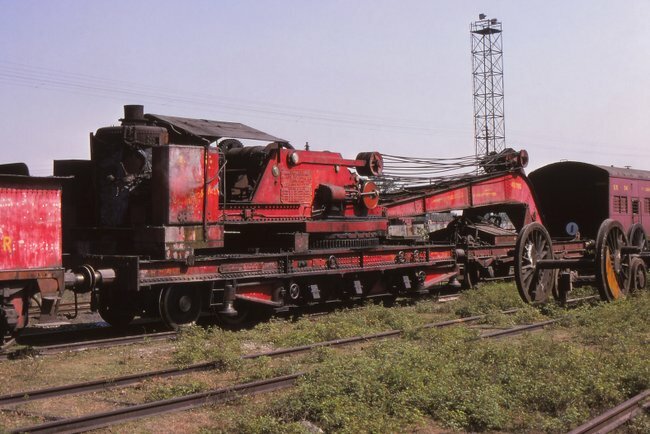 Particularly popular were the very similar 4 wheel steam cranes that both firms produced. The basic design is often referred to as the 'Leeds type' or 'Rodley type' and has the steam boiler counterbalancing the jib with a tall column pivot, making them very stable machines. These cranes proved so popular that the works both struggled to meet demand and very similar cranes were produced by a number of other firms around Leeds at the time. There continued to be close ties between the various firms in the local crane making industry with key personnel often moving between companies and the crane business of the smaller firms that were wound up over the years being taken on by the bigger firms. 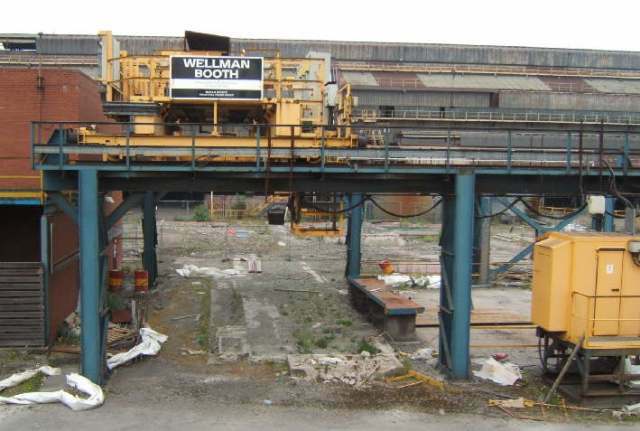 In the end a series of mergers saw the local crane makers in the hands of one firm Wellman Booth who continue to design cranes to this day from offices in Yeadon. With so many firms in this area making cranes we have listed the companies alphabetically. From the menu below you can skip to the maker you are looking for. Above - Surviving William Balmforth steam crane on Gloucester Docks (photo Kris Ward). As well as steam cranes William Balmforth is also known to have built a small number of outside cylinder vertical boiler locomotives. William Balmforth died around 1880 and his executors ran the firm for a number of years until his sons took over in 1897 and the company was renamed Balmforth Bros Ltd. More about this company's unusual engines can be found in this article from Narrow Gauge World. The Peel Ings Foundry was a fairly small concern and it only lasted until 1916. It was bought by Samuel Butler & Co who subsequently built some steam cranes in their works in Stanningly and soon closed the Peel Ings Foundry. 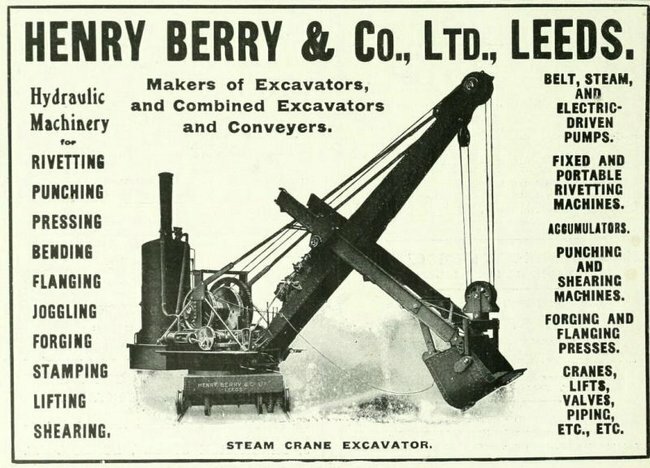 Established in 1883 and based in the Croydon Works in Hunslet from 1885, Henry Berry were noted more for work in hydraulics, however in the early 1900s they also advertised steam excavators. 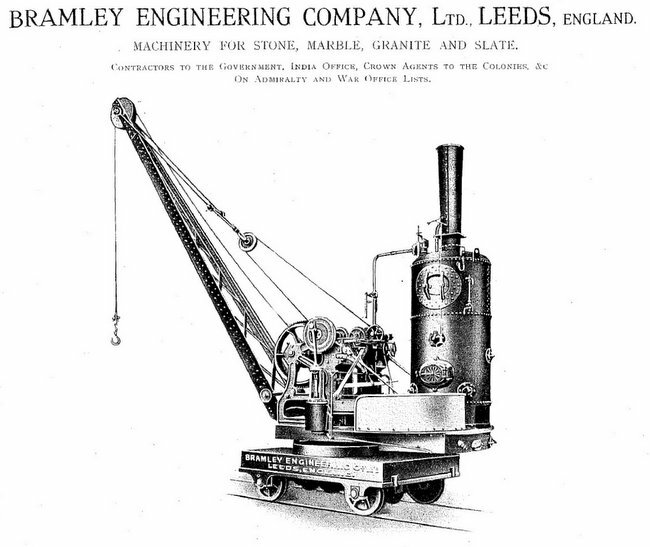 In 1920 the firm aquired Bramley Engineering who made machinery for the quarrying industry, including steam and other cranes. 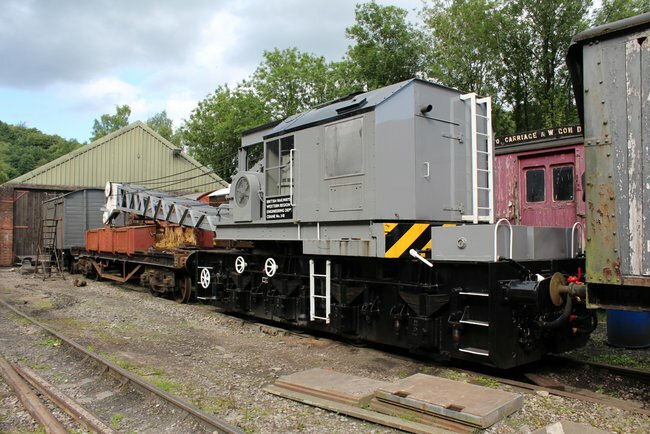 The firm of Henry Berry continued operating in Hunslet into recent years but are now part of the Rhodes Group and are currently located in Wakefield, they advertise machinery for railway workshops with exports of machinery for railway workshops across the world. Since the original crane making partnership split in 1847 the two key firms in this story, Thomas Smith and Joseph Booth, had been operating successfully side by side. With the large number of construction projects taking place around the world large numbers of cranes were needed, notable examples supplied by Booths being London's Tower Bridge and the financial disaster that was the aborted Wembley Park Tower project, London's answer to the Eifel Tower. In 1902 the Railway Magazine commented "If the Wembley Tower Company could have raised the money as quickly as these cranes raised the girders, the growth of the tower would not have ceased so abruptly." Like Smiths, Booths began using electric power around the turn of the 20th Century and in 1902 The Railway Magazine recorded "This branch is rapidly extending, electricity being capable, under modern conditions, of applications in many directions cognate to the business of the firm, who, of course, make electric cranes." Producing the electric motors for their electric cranes in house, Booth's went on to use these motors in other applications. A number of battery locomotives were made under the Union trademark. The range included small battery shunters and mine locomotives. From 1875 onwards Booths made large numbers of overhead cranes for use in factories. In 1903, a local newspaper article recorded "The noted Booths Bros. Self-Contained Steam Overhead Cranes and Goliath Cranes are largely used the world over by Railway Companies, Contractors, Government Works, &c., and they build these wonderful lifters to suit various spans, with a capacity of raising from 5 to 100 tons." In later years, as demand for rail mounted cranes dwindled, this company turned more to the production of overhead cranes.One unusual use for a Booths product was the supply of a crane to the Sultan of Morocco to lift stills used in the production of perfumes, much of which was being produced to supply the palace harem. 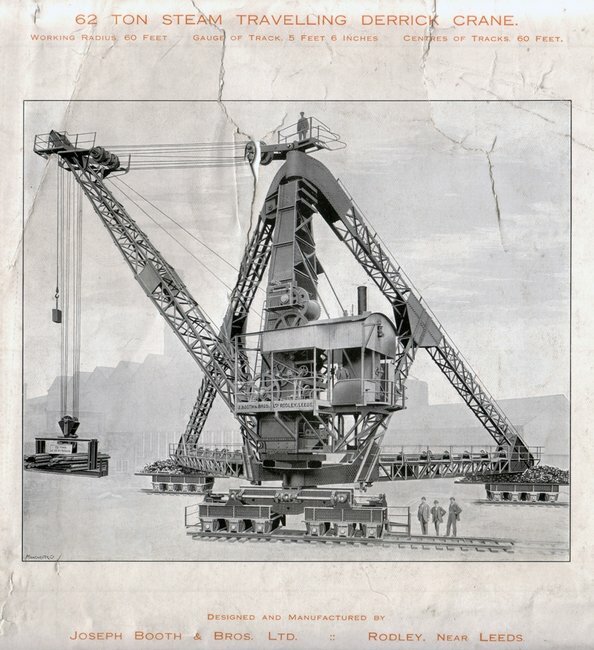 One of the most impressive of the firm's steam powered products was a 62t steam powered travelling derrick ordered by Weetman Pearson for constructing an extension to Valparaiso harbour in Chile in 1914. With the engine towards the centre of the structure, drive to the rail mounted bogies was supplied by shafts to the three bogies. Joseph Booth & Bros went in to liquidation in the 1920s depression and was bought by John Baker (1920) Ltd. John Baker was part of the Rotherham steel making family behind Baker & Bessemer. The new ownership saw Booths produce a lot of material for the steel industry, particulally for Baker & Bessemer's Kilnhurst works in Rotherham, the company diversified a long way from being a crane maker, fabricating everything down to the structural metal work for the works. 1864 established Gateshead engineering firm Clarke Chapman bought significant shares in both Joseph Booth & Bros and Mossend based crane maker Clyde Crane. Both companies were merged to form Clyde Crane and Booth Ltd in 1937. One of the new company's more high profile projects was the 1957 built 'Bradwell Goliath', a massive 200 ton crane used to construct Bradwell nuclear power station. Then the biggest crane of its type in the world it was featured in the British Pathe newsreels. A similar crane was also employed at Dungeness power station. Though the crane was designed so it could be dismantled and re-used it in fact had a spectacular decomissioning when it was finished with at Bradwell, being blown up on the BBC news. Booths also built some large rail mounted cranes for use as breakdown and civil engineering cranes. In 1958/59 Booths produced a series of ten 8 wheel Civil Engineers’ cranes for BR Western Region. Some might be familiar with the Airfix kit that was produced of these cranes, Booths having assisted the model manufacturers by providing various plans used in the production of the kit. In the 1960s another series of mergers began to take place. 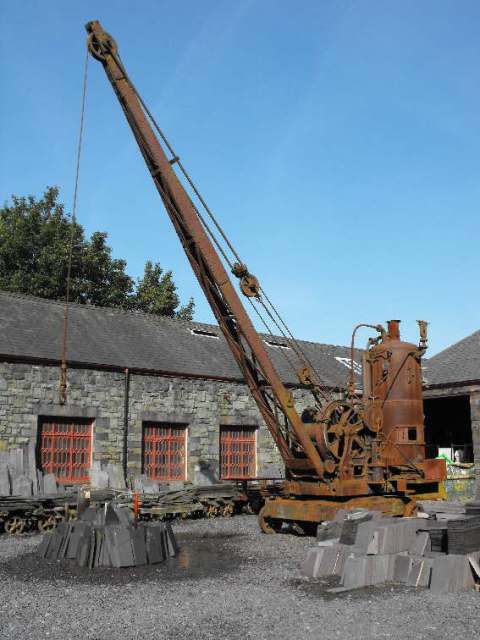 In 1961, Clyde Crane and Booth Ltd also acquired the Carlisle crane maker Cowans Sheldon. Following the aquisition of Cowans Sheldon this was chosen as the brand name for Clarke Chapman's railway crane business. Booths designed railway cranes were advertised in the Cowans Sheldon catalogue and the works in Leeds concentrated on overhead cranes. 1961 saw the opening of a new head office for the Clyde Crane & Booth group 'Woodeson House' adjacent to the Rodley works. In 1969, three of the giants of the crane industry merged, Clyde Crane and Booth Ltd, Sir William Arrol and Co Ltd and Wellman Cranes becoming the Crane and Bridge division of Clarke Chapman Ltd. In 1977 Clark Chapman became part of Northern Engineering Industries Plc and in 1978 they took over Thomas Smith In effect the group now owned most of the UK's crane making industry. The Clarke Chapman group was taken over by Rolls Royce in 1989 and by Langley Holdings in 2001. The Booths name can still be found on cranes from Clarke Chapman subsidiary Wellman Booth. The company now operates from an industrial unit in Yeadon where the in-house design work takes place, manufacturing being contracted out. Booths original Union Foundry has now been demolished and housing has been built on the site. The firm still specialises in overhead cranes and still carries out a lot of work for the nuclear power industry. Above - A Wellman Booth overhead crane at Scunthorpe steel works, though this is rather small compared to some of the cranes produced for the nuclear industry (but easier to take a photo of). This company supplied machinery to the quarrying industry around 1904 to 1920 and amongst their products they advertised steam and electric cranes. Their catalogue illustrated a typical Leeds steam crane together with various derricks, hand cranes and overhead cranes. In the 1920 the firm were taken over by Henry Berry in Hunslet, mainly a manufacturer of hydraulic machinery but they to advertised steam excavators in their product range. The Stanningly Ironworks is noted more for its structural metal work which included York's station roof. 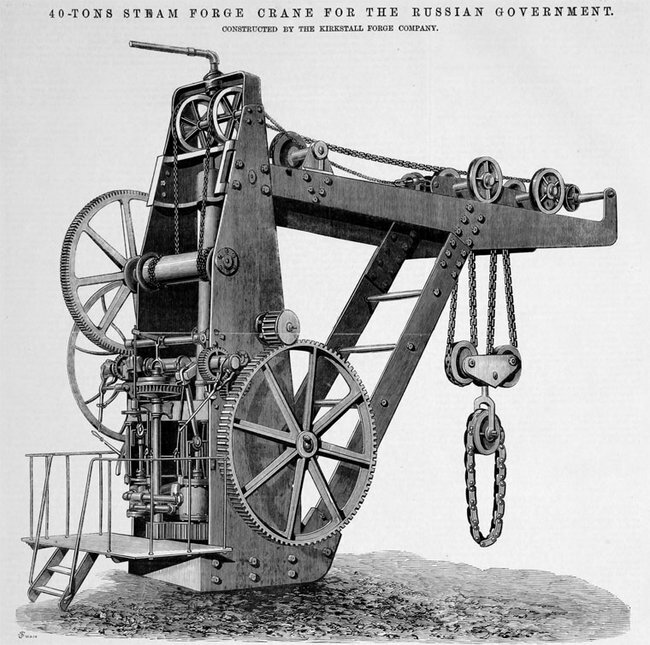 From around 1880 some steam cranes were produced to the familiar Rodley design. Several orders from John Butler are recorded in the surviving records from Joseph Booth so it would be interesting to verify if John Butler was subcontracting the work or if these cranes were in fact for use in the Stanningly Ironworks. The works closed in the depression of the 1930s. Samuel Butler was a member of the Butler family that owned Stanningly Ironworks. He founded his own Albion Works around 1904. The core of the business was structural metal work such as bridges but with the acquisition of Balmforth Brothers in 1916 they went in to crane production and recruited a crane design engineer with experience from previous work at Stothart & Pith in Bath. A number of orders were received from India, though serious problems with some 40 ton breakdown cranes ordered in 1925 for Indian Railways saw the firm leave the crane business. While famous for their steam trams, locomotives and rollers, Thomas Green produced a huge range of items in their Smithfield works. For a time they advertised steam cranes and produced an illustration following the usual 'Leeds Crane' basic design, it is not known at present if any of these cranes were built. Job Isles' birth certificate confirms he was was born on 1/11/1842. In the 1851 census he is a scholar age 8 living with his parents and brother at North street Calverley. In the 1861 census he is a woollen weaver age 18 living with the family at 28 Well Street Farsley. His Obituary in the Pudsey News in 1919 reports that from about 1862 to 1864 he was a clerk at Thomas Smiths in Rodley and in 1865 to 1868/9 was a bookeeper at Springfield Ironworks on Bagley Lane Farsley. 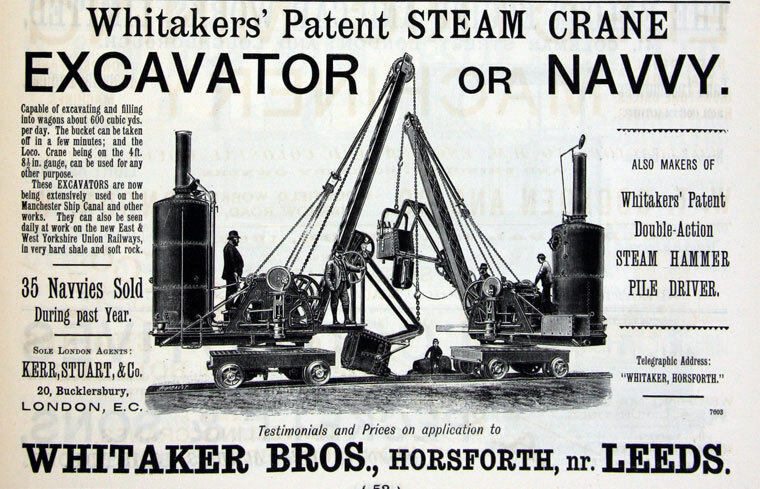 Certainly In 1869 he and two partners (Thomas Whitham and Ben Johnson) commenced making steam cranes at Prospect Works on Robin Lane Pudsey trading as 'Isles and Whitham' and 2/3 years later he and his partners purchased land in Swinnow (corner of Cross Harrison Street and Leeds and Bradford Road) and built Prospect Foundry. It is little surprise that Isles' range was similar to that of his previous employers Thomas Smith. The Lancashire & Yorkshire Railway were one of the best customers for Isles' cranes but they also supplied to the Great Central and Great Western. Isles cranes also found many industrial uses and were involved in many construction projects. Like the other local firms they produced overhead cranes for factories and were begining to use electrical power by the turn of the Century. In 1928 the firm quit the crane business, possibly an effect of the economic downturn that saw many engineering firms close at the time. Isles as a company survived the downturn but took took a different direction becoming a Yorkshire service agent for Leyland Trucks. They were appointed Leyland service agents initially for the Leeds/Bradford area and later for the whole of Yorkshire. After Job Isles' widow, Gertrude, died in 1963 the company was managed by members of the Isles family until, in 1968/9, the company was purchased by the Hargreaves motor group then based in Brighouse. Isles Ltd had therefore been in existence for about a hundred years. They continued as such in to the 1980s and established a new garage, Chatfield DAF which survives to this day. John S. Brownlie's book on railway steam crane manufacturers records that "the firm of Benjamin Johnson Ltd, Mill Lane Works, Bramley, was once an important producer of cranes with a turn over of over 3000 between 1875 and 1915." It is surprising therefore that we have found very little mention of this firm and have not found detail in local directories or engineering journals of the time. We have seen a photograph of a steam crane from the firm (sadly we can't reproduce this for copyright reasons). The crane is not of the usual 'Leeds Type' without the common large central pillar, it has low horizontal cylinders. A Benjamin Johnson was added to the partership at Isles of Stanningley on 15th October 1870, while it could be an extrodinary coincidence for two people with the same name being in the crane industry in such close proximity we've only seen one in the census (and that shows his son Joseph Naylor Johnson living in Mill Lane Bramley) so it seems highly likely that there was a connection between the firms. It is possible that Isle's Prospect works were situated on Robin Lane almost opposite the junction of New Street. In May 2016 there are premises called Victoria Works at this junction and the 1901 rate book indicates that these premises were occupied by B Johnson. Kirkstall Forge can trace its history back to 1151 and the need for materials for the construction of Kirkstall Abbey. The "modern day" Kirkstall Forge began in 1779 when the historic forge was taken over by the Beacroft and Butler families (seemingly no relation to the Butlers of Stanningly who ran a couple of metal working firms mentioned elsewhere on this page). For much of their history the core of their business was axles and shafting, however they also manufactured all manner of machinery including stationary steam engines and steam cranes. Kirkstall Forge operated at the site until it was taken over by Dana Corporation in 1995, who over the next 6 years shifted production overseas and closed what was England's oldest forge. The site is being redeveloped with homes, offices and shops, however a small number of the most historic buildings have been retained. 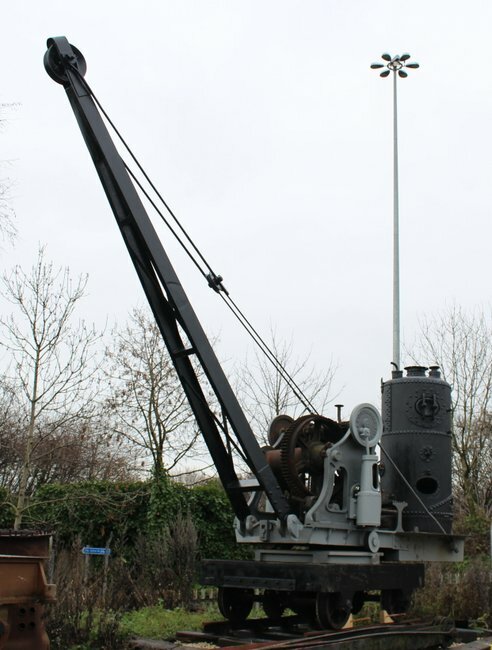 The part of the old works which was referred to as the "museum" by works staff includes a rail mounted hand crane the company had supplied to the Isle of Wight railways that they brought back to the works to become a display item. Though the area is currently fenced off, this can be seen from trains passing the new Kirkstall Forge railway station built to serve the development. Smith, Beacock & Tannett were machine makers and operated in the former Round Foundry works. Amongst the machinery they produced was one of the overhead steam cranes used in the Monkbridge Iron Works. Another engineering and boiler making firm operating in Leeds at the Regent Foundry on Skinner Lane, not far from Thomas Green's Smithfield works. Cranes for Railways were advertised amongst the products available from this company. As mentioned in the introduction, Thomas Smiths were formed from part of that early partnership of Balmforth, Smith and Booth that produced much of the local crane making industry. From Thomas Smith going his own way in 1861 the company's history follows a similar course to that of their next door neighbours Joseph Booth, in fact they ended up part of the same group at the end as they had done in the beginning. Smith's cranes found their way on to many docks and canal sides as well as railway yards and construction sites. Some of the largest construction projects to use Smith cranes were the Manchester Ship Canal, the Mersey tunnels, the Aswan Low Dam, the Lower Zambesi Bridge and the Sudan Barrage. As early as 1894 Thomas Smith were producing electrical powered cranes. The first electric crane was an overhead crane for use in the John Fowler works. Thomas Smith were one of the pioneers of excavator development. In 1887 the firm fitted a shovel attachment to one of its 3 Ton steam cranes and soon after fitted another with Jubb's patent trenching equipment. In later years such machines would dominate the firms output. Eventually the internal combustion engine would replace the steam engine as the power source in their cranes and Caterpillar tracks fitted versions were offered as an alternative to moving around on railway wheels, these became more popular in later years as the railway industry lost its dominance. The company was taken over by Thomas W. Ward shortly before World War II and a bit of a reorganising took place. Overhead cranes were produced by TWW company John Smith (Keighley) with Thomas Smith concentrating on the various forms of travelling cranes and excavators. In 1978 Thomas Smith were taken over by Northern Engineering Industries. NEI had taken over many big manufacturing companies which by this time included Cowans Sheldon, Clyde Crane, Wellman Cranes and Joseph Booth. 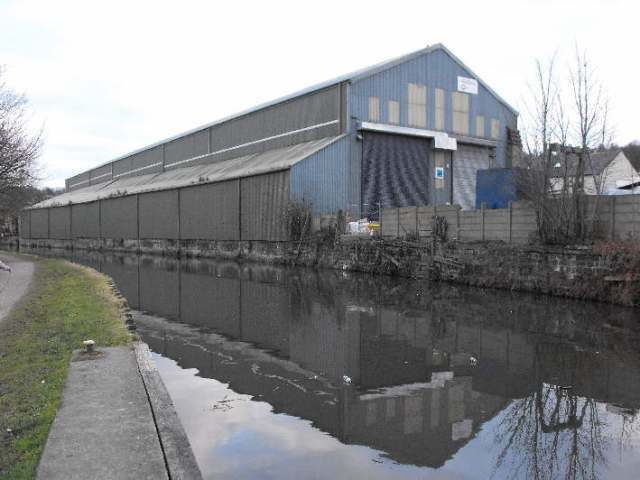 Eventually both the Smith and Booth works on Rodley's Town Street closed as Wellman Booth moved to smaller office premises in Yeadon from where they continued to design overhead cranes but contracted out the engineering work. The Booth works was redeveloped as housing but Smith's former Old Foundry buildings still survive in industrial use. Below - The former Old Foundry of Thomas Smith & Son. The Whitaker family had quarrying interests in the Horsforth area. Samuel Whitaker established an engineering firm, Whitaker's Engineers. Naturally the core business of this firm would be supplying machinery for quarry use, this included cranes and excavators. The engineering firm merged with the family quarrying contractors and engineers firm around 1872 to form Whitaker Brothers Contractors & Engineers. 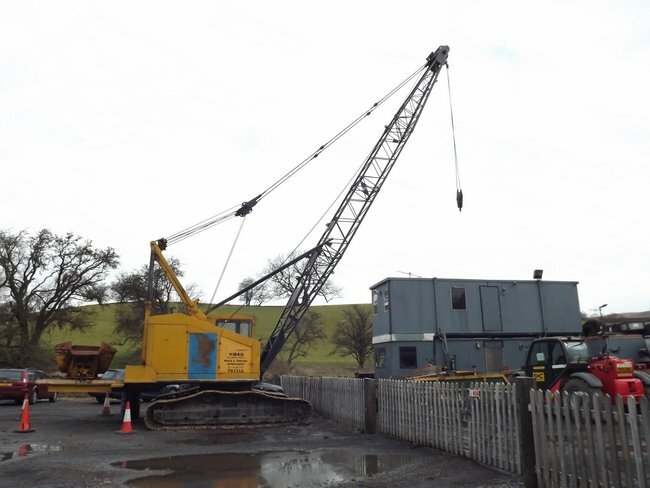 Initially the cranes themselves were bought in from other local firms and the necessary attachments for excavating were produced in house but the company soon began producing their own cranes. The company supplied several cranes for export as well as supplying the UK quarrying industry. In 1910 the company was sold to Ruston Proctor of Lincoln, this company were already a successful producer of excavating equipment and they soon closed the Horsforth works . With some great contributions we are building up a nice collection of archive material of these firms. The Joseph Booth gallery has benifited from a contribution of good quality images dating from around 1914-1924. 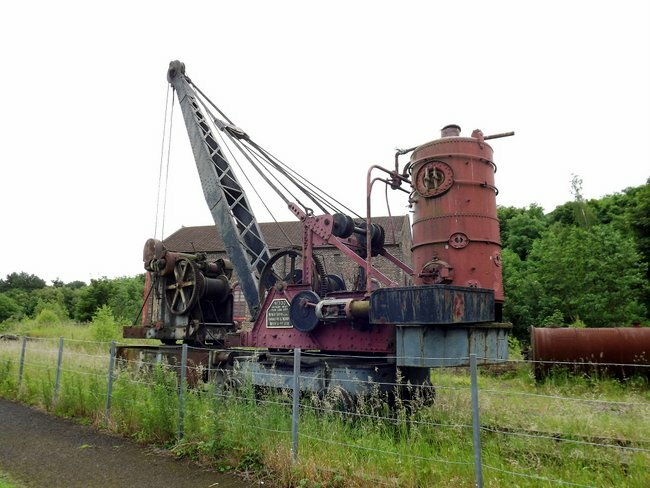 Our database has most records of Joseph Booth's output from the oldest surviving records of 1890 to the end of steam crane and railway crane production in the 1960s, though there are still some records to add. We have scanned a few volumes of Thomas Smith's records, with thanks to Wellman Booth, and are currently in the process of adding these to the database. We have also added details of surviving cranes that are known of around the worls, with thanks to Chris Capewell. The Yorkshire Group of 16mm Modellers has a good write up about the Leeds crane makers on its website. www.smith-cranes.nl (in Dutch) Translation This sites has lots of material about Smith's excavators, crawlers and truck cranes. Wikia page about Thomas Smith. Graces Guide entry about Joseph Booth. Graces Guide entry about Thomas Smith. Graces Guide entry about Bramley Engineering. Graces Guide entry about Henry Berry. Proud Heritage, A History of Thomas Smith & Sons (Rodley) Ltd, Frederick H Smith 1947.